Tuesday, 22C: "The Spirit scrutinizes everything"
... even the depths of God. One cannot believe in Jesus Christ without sharing in his Spirit. It is the Holy Spirit who reveals to men who Jesus is. For "no one can say "Jesus is Lord", except by the Holy Spirit", who "searches everything, even the depths of God. . No one comprehends the thoughts of God, except the Spirit of God." Only God knows God completely: we believe in the Holy Spirit because he is God. The Church never ceases to proclaim her faith in one only God: Father, Son and Holy Spirit. Monday, 22C: "I resolved to know nothing while I was with you except Jesus Christ"
Christians believe that "the world has been established and kept in being by the Creator's love; has fallen into slavery to sin but has been set free by Christ, crucified and risen to break the power of the evil one. . ." (GS 2 § 2). 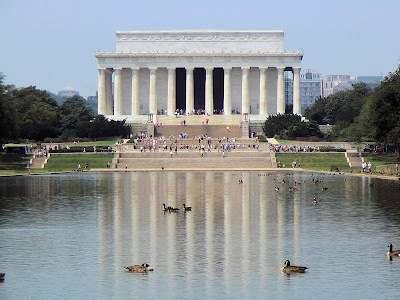 I took the opportunity Friday to run near the Tidal Basin in Washington. 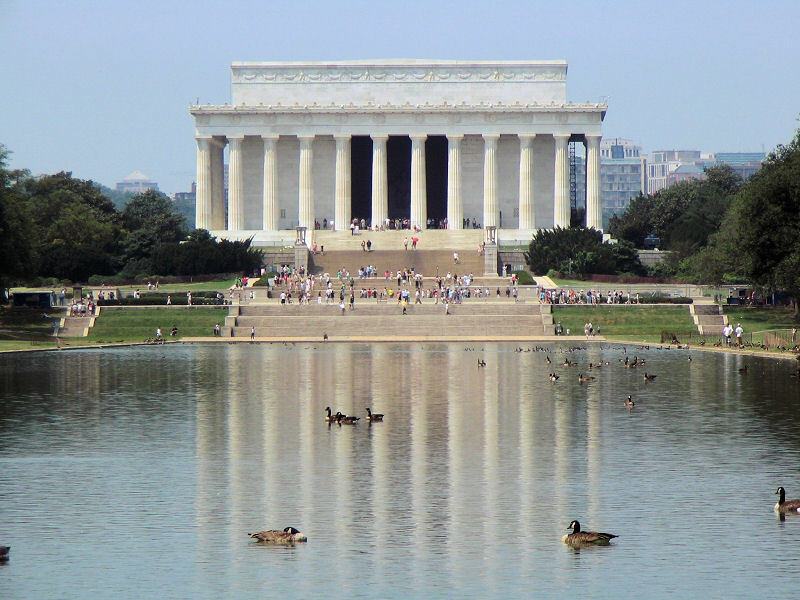 As I ran, I had the opportunity to reflect on all the great Americans who are memorialized in the grand and beautiful monuments that surround the visitor to the capital city. I thought about what makes people great, important, and worth remembering. Would we forget these human beings if there were no piles of marble and stone dedicated to their memory? And I realized that, yes, given all of the things that each of us learn, there are probably many more things that we forget, including other people and their heroic and exemplary deeds. The monuments we build hold up for us the models of human greatness that have gone before us. But they can also serve to make us feel small and insignificant. There will be very little left behind to mark the passage of most of us through this life on earth. But the Lord, who we know is the greatest One of all, who is God, holds up for us who know our littleness the way to be great: He says we must seek to be the last. Now, that doesn’t sound great at all, to be the last and the least. How will doing so enable us to leave a mark on the lives of others, and to make the world a better place? Saint Zephirinus / S. Zephirini Papae et Martyris: "“Who, then, is the faithful and prudent servant"
... whom the master has put in charge of his household to distribute to them their food at the proper time? Blessed is that servant whom his master on his arrival finds doing so. Amen, I say to you, he will put him in charge of all his property. 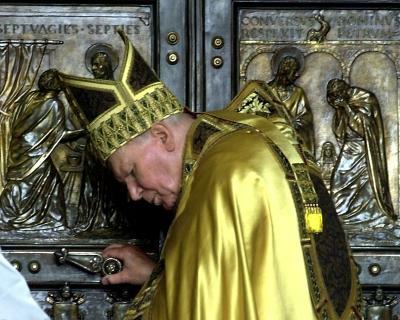 "Strive to enter by the narrow door." 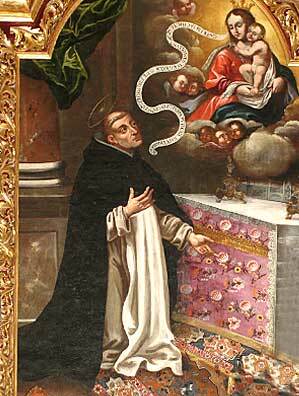 "Once committed to conversion, the heart learns to pray in faith. Faith is a filial adherence to God beyond what we feel and understand. It is possible because the beloved Son gives us access to the Father. He can ask us to "seek" and to "knock," since he himself is the door and the way." (CCC 2609) Jesus is the door. 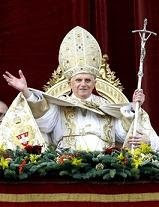 His Body on earth which is the Church gives access to him and to the way of salvation. The disciples ask a question that continues to be of importance to many today. Every manner of person, Catholic or not, Christian or not, all want to know: Does life go on after this world? If it does, is there a heaven and a hell? Some give up wondering and just say, like a famous actress once did, "I don't look forward to heaven, I don't look forward to hell, I just look forward to oblivion". Perhaps, by saying so, she wanted to sound sophisticated and condescending, as if to maintain the supercilious upper class hauteur for which she had become famous. Regardless, even for one who reacts thusly, the mystery is not resolved this side of the grave. Only faith can assure us with the knowledge that the soul is eternal, and that it is a natural consequence of the gift of our free will that when we depart this life we will either go to heaven, perhaps by way of purgatory, or to hell, a traditional name for the state of eternal separation from God. God has revealed his desire that all be saved and come to the knowledge of the truth desire since the time of Adam and Eve. This revelation was not broken off by our first parents' sin. After the fall, [God] buoyed them up with the hope of salvation, by promising redemption; and he has never ceased to show his solicitude for the human race. For he wishes to give eternal life to all those who seek salvation by patience in well-doing. Even when he disobeyed you and lost your friendship you did not abandon him to the power of death. 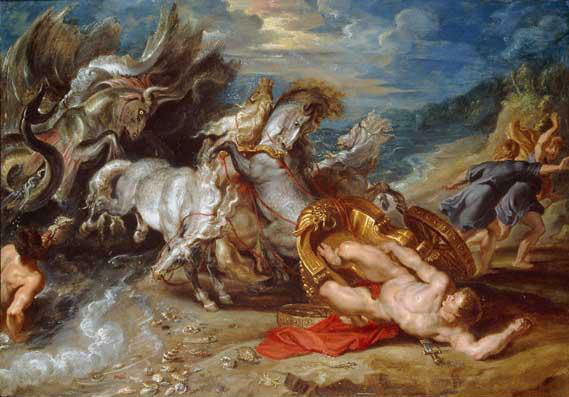 . . Again and again you offered a covenant to man. (Roman Missal, Eucharistic Prayer IV) (CCC 55) The narrow door is the way of Christ Jesus. One enters the way of life in Christ, of the grace of the sacramental life, beginning with baptism. 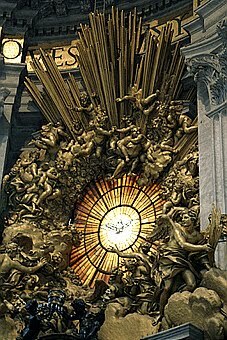 The fullness of the life of sanctifying grace in the universal Church enables man to fully live the law of God in love. Thus living the life of grace, man and woman look forward with confidence to their salvation in Christ. For those who die before the final judgment, depicted with such awesome grandeur by the artistic genius Michelangelo in the Sistine chapel, there comes first an individual judgment. Then, at the last trumpet all will rise, both the living and the dead, to learn who will and who will not be saved. The final judgment is an article of faith which we proclaim each time we recite the Creed. Each of us prepare throughout our lives on earth for that great and final day when we meet Christ face to face, he who knows us perfectly, but also loves us perfectly. At the judgment we will learn whether we truly loved Him in return and thus can enter into the joy of the Lord. In the presence of Christ, who is Truth itself, the truth of each man's relationship with God will be laid bare. (Cf. Jn 12:49.) The Last Judgment will reveal even to its furthest consequences the good each person has done or failed to do during his earthly life: All that the wicked do is recorded, and they do not know. When "our God comes, he does not keep silence"...he will turn towards those at his left hand:..."I placed my poor little ones on earth for you. I as their head was seated in heaven at the right hand of my Father-- but on earth my members were suffering, my members on earth were in need. If you gave anything to my members, what you gave would reach their Head. Saint John Eudes: “The Kingdom of heaven may be likened to a king who gave a wedding feast for his son." "Many are invited, but few are chosen." 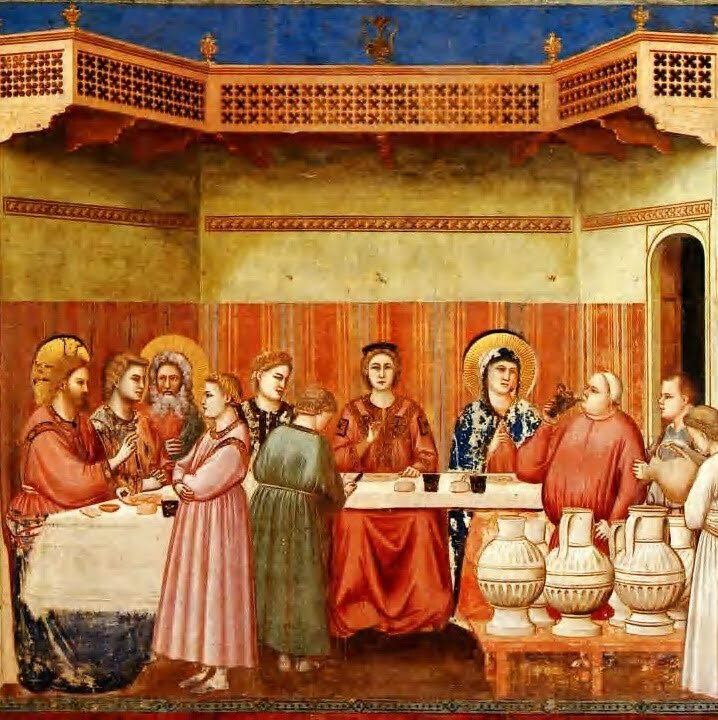 In an ancient prayer the Church acclaims the mystery of the Eucharist: "O sacred banquet in which Christ is received as food, the memory of his Passion is renewed, the soul is filled with grace and a pledge of the life to come is given to us." 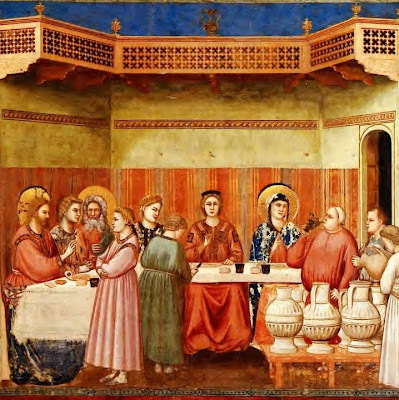 If the Eucharist is the memorial of the Passover of the Lord Jesus, if by our communion at the altar we are filled "with every heavenly blessing and grace," then the Eucharist is also an anticipation of the heavenly glory. "I myself will look after and tend my sheep." Children in turn contribute to the growth in holiness of their parents. Each and everyone should be generous and tireless in forgiving one another for offenses, quarrels, injustices, and neglect. Mutual affection suggests this. The charity of Christ demands it. 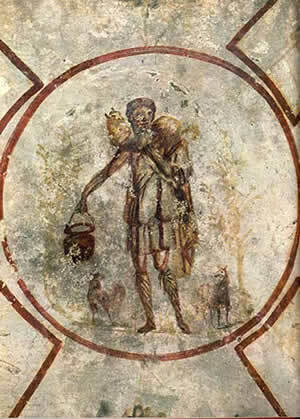 Art: Fresco of Christ the Good Shepherd, catacomb of S Callistus, Roma. for the sake of my name will receive a hundred times more, and will inherit eternal life. There are three forms of the virtue of chastity: the first is that of spouses, the second that of widows, and the third that of virgins. We do not praise any one of them to the exclusion of the others. . . . This is what makes for the richness of the discipline of the Church. 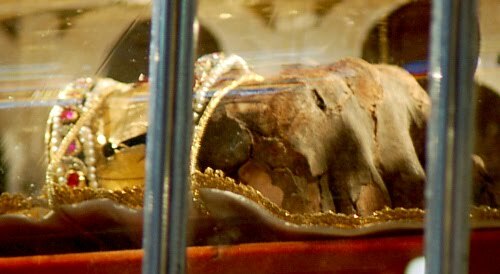 Saint Stephen of Hungary: "Give to the poor"
... and you will have treasure in heaven." ... faithfully upward with Mary in Christ for our place in the Kingdom of Heaven. Is life like a plane full of obnoxious and ungrateful passengers from whom we must escape by pulling the emergency door and sliding down the inflatable chute in an irresponsible crash landing with two beers in hand? No, this response does not end our problems but simply creates more as we face the consequences of a rash and ill-considered impulse. Are our life and family problems dealt with best by “eating, praying and loving” our way through exotic locations around the world, in order to sample other people’s lives as though we can “shop” for answers? When the vacation is over we still have to go home and work to pay our debts and take care of our families. Through Mary, the Mother of God whom our Lord has given to us with His dying words on the Cross, we see an answer to this and other questions about our lives, our problems and sorrows, and the way through the world and all it holds to the place of promise where all our dreams are more than fulfilled. 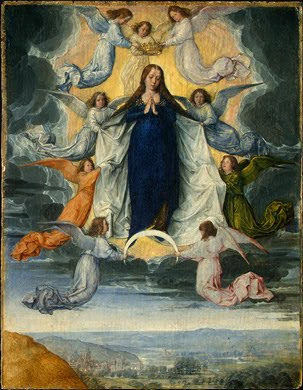 Mary’s glorious assumption, body and soul into heaven, is God’s reward for her faithful love through the sorrows, disappointments, tragedies and sins of this world. 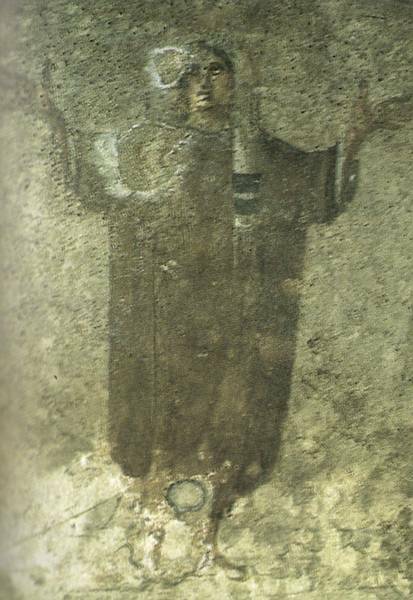 Mary had many problems from which she certainly must have been tempted to escape, as a believing Jew found with child before marriage in violation of the moral teachings of her people, an engaged girl faced with the possibility of divorce before she was able to even begin her married life, a Son who was so unusual as to be unique in all of history: the God-Man, whose Father would call Him to give His life in a bloody and ignominious death on a Cross. These were just some of the sorrows that Mary bore in faithfulness to her vocation and to the God who had called her to this way of life. Despite her human preferences Mary carried and bore the Son of God though he was conceived not by man but by God in a manner hardly to be believed even by her devout family and community. Despite her fears, Mary accompanied her Son and supported Him according to her abilities throughout his public mission. Finally, in the most abhorrent violation of the wishes and desires of a loving mother, she had to watch him destroyed violently on the Cross, the blood he drew from her own virginal body draining away from His broken Flesh on the Cross. No mother can be expected to face such a violation of the life-giving vocation of motherhood without questioning, perhaps in anger, the ways and will of God. How strange, that the death of God has been the only death in all of history directly willed by Himself? And Mary was the one whom God chose to bear the holy Victim Who, only by dying, could destroy the death of mankind lost by sin and, by rising, restore the life of every human being from the beginning to the end of the world? Each one of us must bear our crosses, those sorrows and heavy burdens that are part of the vocation to which God has called us. And all of us must learn as Mary did, with her example before us, to face the sorrows and evils that disfigure humanity and make people question the existence of a loving God, to ”eat, pray and love” not in escape from the people and commitments of our vocations but, rather, as faithful disciples and lovers of God. There is no “escape hatch” from life, and the “passengers” on the journey around us, who sometimes tempt us to disgust because they are Christ in distressing disguise, have been given to help us on our call to salvation, and we to them. Let us not forget that our first concern must be our personal sins, which disfigure the image of God in each of us! At the end of her earthly life, after remaining faithful to God’s call through the outrages of sin and evil in this world, Mary was crowned with the gift of God’s eternal life and love by being “assumed”, that is taken up and received by God our heavenly Father, into the Kingdom of Heaven. Where Mary has gone, there we also hope to follow. Who would not want such a mother, who herself helps to make room for us in the "place of God's glory", our heavenly inheritance as the children of the "Ark of God's holiness", the Blessed Virgin Mary. Saint Maximilian Mary Kolbe, priest and martyr "All lives are mine." "The life of the father is like the life of the son. Only the one who sins shall die." 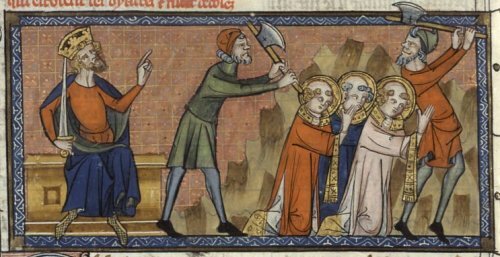 Saint Hippolytus: “Not all can accept this word"
for the sake of the Kingdom of heaven. Whoever can accept this ought to accept it." Saint Sixtus II, pope and martyr, and companions, martyrs: "the souls of the just are in the hand of God"
"Do not be afraid of those who kill the body but cannot kill the soul; rather, be afraid of the one who can destroy both soul and body in Gehenna. Tuesday, Week 18, C: "Take courage, it is I." "... do not be afraid." Peter said to him in reply, "Lord, if it is you, command me to come to you on the water." He said, "Come." 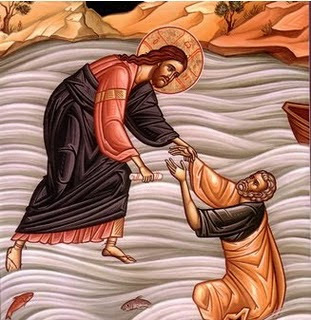 Peter got out of the boat and began to walk on the water toward Jesus. But when he saw how (strong) the wind was he became frightened; and, beginning to sink, he cried out, "Lord, save me!"